We all know the problem with anti-slip crushed glass. We’ve all been there before. We’ve all got the t-shirt. Time spent selling the drive, ordering the resin bound supplies, organising the install, laying the sub base for the resin, mixing the resin bound aggregates, laying the resin drive, scattering the anti-slip crushed glass….And then you stop. You realise that you have just scattered your anti-slip crushed glass…You can see the white area across the resin bound surface where you have scattered it. Oh dear. This is not an ideal situation. There is now no way of removing it…And you have to to explain to your client why there are white bits of visible anti-slip crushed glass on their driveway. Not the finish they ordered for their resin drive. This is a dilemma that even the most expert anti-skid caster faces at some point in their resin surfacing career. Anti-Slip Crushed Glass Pro is perfect for some resin bound colours. However white will always show white. So if you can see white anti-slip crushed glass on the lovely newly installed resin drive, there is going to be a quality issue for your customer. Even if it is anti-skid. On the flip side, if you try stir away from the problem, you don’t want to spread the anti-slip too thinly across the resin surface. This is because it will adversely compromise the anti-slip properties of the resin bound surface. Ensuring a good looking but reliable anti-slip surface is relevant now more than ever. This is especially considering the past few days of snow across the UK and sub-zero temperatures still lurking cause slippy surfaces. With The Resin Mill always innovating, we have devised Colour Cast Pro. Colour Cast Pro is a range of specially selected coloured anti-slip that elevates the problem of white patches. We now have 4 different colours of anti-slip material that match corresponding resin bound aggregates. Contractors need not worry, as we have taken the pain out of deciding what colour goes with which resin mix. We have already done all the testing and ensured optimal aesthetic value for the anti-slip colours and aggregates. You can be sure to install truly stunning, seamless resin surfacing that has invisible ant-slip with our Colour Cast Pro range. Be sure to check with our sales office if you are unsure. As with our traditional anti-skid product, Anti-Slip Pro, Colour Cast Pro is high friction and acts as a grit, ensuring the safety of your clients family, a workforce or pedestrians. Colour Cast Pro is recommended with every single resin bound install in order to active the anti-skid properties of the resin bound material. 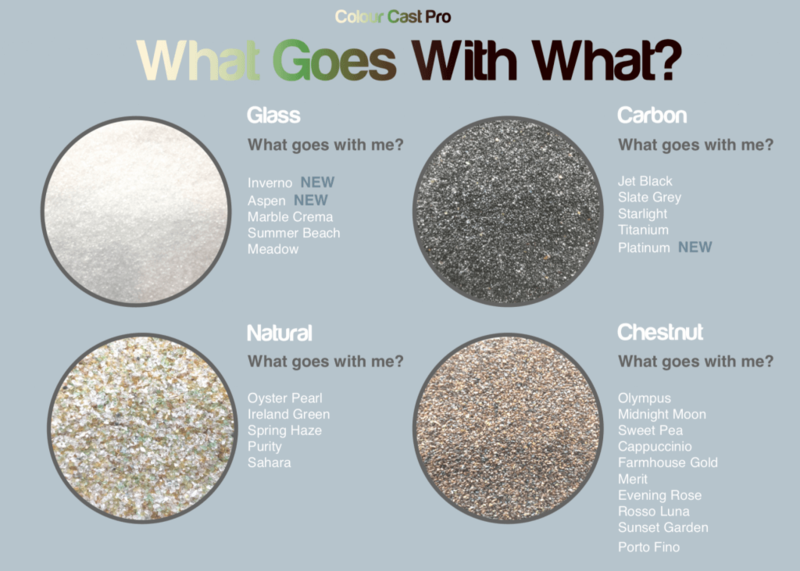 The Colour Cast Pro colours are: Glass, Carbon, Chestnut and Natural. They are packed in easy to handle 5kg bags. This makes it easy to transport and add on to any of your orders. 100g/m² of Colour Cast Pro should be installed on resin drives and surfacing for the optimum slip resistance. It is easily installed, (as with any other anti-skid product), in a ‘cast on’ method. Install after trowelling your resin bound aggregates but before they set. You simply throw a handful of anti-skid material on evenly, as if feeding chicken. This time however, you can scatter in confidence. There is no need to worry about any patchiness on the surface of your resin and you can leave the job satisfied and with happy a customer. Colour Cast Pro could also twin up as a hybrid product, with contractors able to use it as fines to strengthen the resin bound mix. Make sure your clients are safe this season and install Colour Cast Pro – the original product in the resin bound industry that allows for an invisible textured anti-skid finish. It is available only and exclusively at The Resin Mill. For More Information Or To Try Our Colour Cast Pro Today, Call Our Sales Office On 01484 400 855.